A 20th Century Fox writer for hire, Skip Woods has written for – and subsequently ballsed up – several popular studio franchises with A Good Day to Die Hard, The A-Team and X-Men Origins: Wolverine. In an interesting case, he has also provided the scripts for not one but TWO completely separate renditions of Hitman, based on the popular video game series of the same name. The first, made in 2007 with Timothy Olyphant as the bald-headed assassin known as Agent 47, was certainly not a huge hit with both critics and audiences, but that hasn’t stopped our dear Skip from rebooting the film series a mere eight years later with Hitman: Agent 47, now with Rupert Friend – taking over from the originally-cast Paul Walker, before the actor’s death – in the titular role. Why, yes; it IS as rubbish as you may think, and though it’s not as hard to sit through as A Good Day To Die Hard was, you can feel Skip Woods’ thumbprints all over this delightfully idiotic mess of a movie. 47 is here on the hunt for a young woman (Hannah Ware) whose missing father (Ciarán Hinds) holds the secrets to the Agent program, and through a whole bunch of dumb revelations that would frankly make even less sense if we go through all of them, they wind up battling against Zachary Quinto’s John Smith (yes, that is what he’s referred to throughout most of the movie; it’s so stupid that even characters note how stupidly simplistic it is) and a ruthless Syndicate organisation which in no way seems to be related to the Syndicate from Mission: Impossible – Rogue Nation (seriously, don’t watch that movie back-to-back with this one, you will get extremely confused). We’re choosing not to refer back to the game series nor the original 2007 adaptation, mostly because we never played the games nor saw the other film, but you don’t need to do that anyway; it’s such a strangely bad beast that is so enticing to watch that it can weirdly stand on its own with how bad it is. We’re also going to guess that the games had a slightly better grasp of intelligence and sophistication than either of its two adaptations, since there’s definitely none of either those things to be found here – characters do bafflingly dumb things here, such as take guns apart because they can’t sleep (moments before an action scene, mind you) or aim a loaded rifle towards an “intelligent” (emphasis on those quotation marks) assassin who then proceeds to use it to try and escape. We’re not going to go into full details about other acts of stupidity, but believe us it only gets stupider and stupider. Director Aleksander Bach makes his directorial debut here; and boy, does it show. Never mind the fact that most of the action scenes are incomprehensible thanks to the endlessly shaking camera that blurs pretty much every blow, even though it’s not even trimmed down to a 12A, but everything else from the acting to the visual effects feels like it came from the mind of a complete amateur. Regarding the former, Quinto’s certainly having fun as the villain (gleefully reminding us of the good old days when he was Sylar on Heroes) but Friend is extremely miscast as 47 – he’s not even fully bald like in the game – and although his character is meant to be emotionless it’s still shockingly wooden. Everyone else doesn’t even register, not even Thomas Kretschmann who spends a large chunk of the film just sitting behind a desk. As for the visual effects, they’re consistently poor throughout, with certain add-ons like explosions and blood splatters looking less realistic than the actual video game it was based on. The film’s saving grace is that it is so unintentionally funny; some of the deaths, especially a couple in the opening strobe-heavy fight sequence, are so over-the-top in their execution (no pun intended) that they’re almost guaranteed a laugh, and the sheer idiocy of the plot, the characters and the action makes it a considerable laugh riot all the way through. It’s almost a shame that Skip Woods decided not to go all the way through with making Hitman: Agent 47 a straight-up comedy, because it’s so defiantly stupid that even Adam Sandler would have a hard time making sense of it – and when that’s how stupid you can get, you’re in serious trouble. 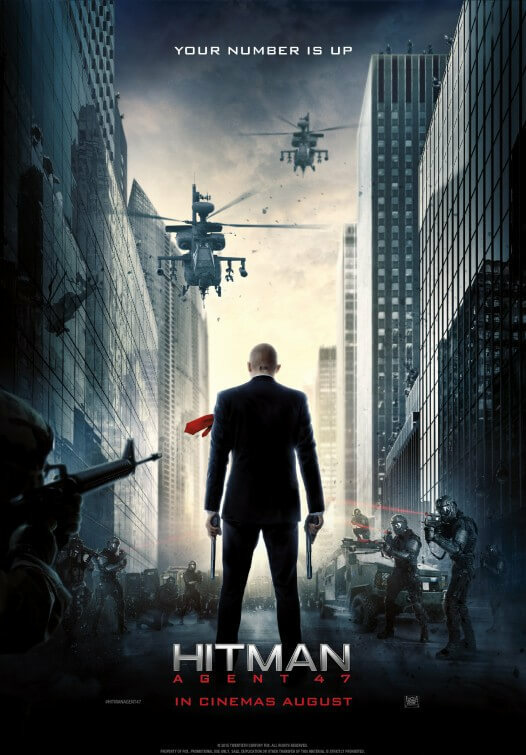 Hitman: Agent 47 makes no attempt to be a consistent action movie, and instead aims for overly-stupid plot twists and characters that make it unintentionally funny for some, but mindless drivel for others.